Suddenly I had a very different story on my hands from the one we had planned to shoot in Lebanon. Instead we shot the film partly in Reykjavik, working with a great local producer, Hlín Jóhannesdóttir and her team, and then in France just before Christmas 2011. Mazen was travelling across to Paris to work with his french translator on his new collection of poetry, An Angel Suspended on a Clothesline. When Mazen wrote DNA he had never been to Paris or France. It seemed very serendipitous that we had these words, these aspirations in his poem, and Mazen was now travelling to France to work on his poetry. So it was through working closely with his poems that I started to sculpt the film narrative, as many of his works have a strong personal, almost autobiographical voice and are often both dark and beautiful in their observations. 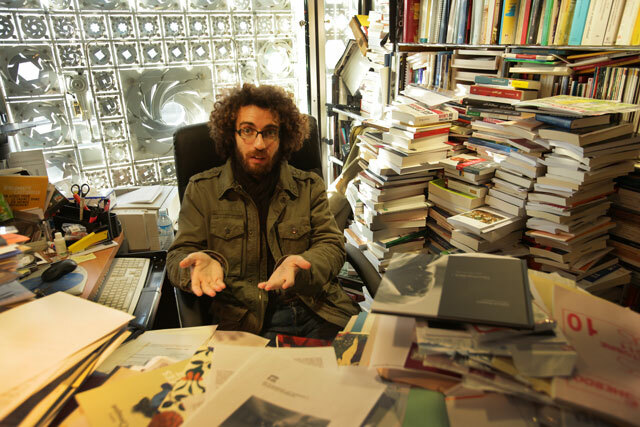 In our film Hand Made we follow Mazen on his new journey, with his notebook in hand, sculpting poetry from the "traces of beauty" he encounters on his path in exile. This episode of POETS OF PROTEST can be seen on Al Jazeera English from Friday 28 September at the following times GMT: Friday 19:30; Saturday 14:30; Sunday 04:30; Monday: 08:30. British Summer Time is GMT+1h.